Get ready to experience an adventure that takes you back in time of what gold miners of Alaska endured during the gold rush days. Your tour begins with a relaxing one-hour scenic float trip on the Kenai River. Once docked, you’ll hike for approximately ½ mile to Wild Creek where you will begin your gold panning adventure. 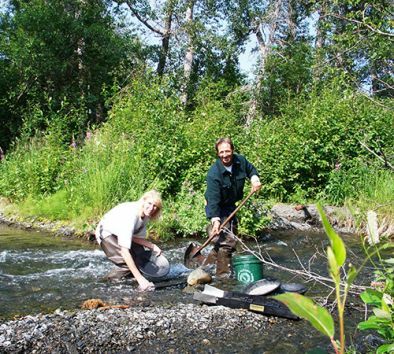 You will get a demonstration on gold panning along with a safety briefing before your search for gold begins! Enjoy your picnic lunch before leaving Wild Creek. You’ll enjoy a 2½-hour float trip to Jim’s Landing where your shuttle awaits you to take you back to the lodge. Dress in warm layers. Rubber boots, rain gear and panning equipment will be provided.